Eric’s eccentric Aunt Raven and Uncle Ed are coming to stay with us tomorrow. I am happy to have them stay with us, especially since they have been so hospitable to us when we go up their way to visit Burlington, VT. Partly, I’m just excited to have more people to cook for! Does that make me weird? I want to jump at the opportunity to push food on people. Actually, I think that is just my Italian roots coming out. My Nonny always finds something to feed me when I visit, whether I’m hungry or not. It always turns out to be delicious, so I have a hard time turning her down. In the end, Italian hospitality will always find a way into your stomach. Recently, I’ve learned that I love to entertain for people. Not necessarily the whole organizing part of it, but I love cooking for people. The only problem I see with entertaining is needing to clean before people arrive and after they leave. When I came home tonight, there were dirty dishes on and around the sink, piles of clothes coming out of the hamper, and stacks of my to-read books scattered around in several rooms.Needless to say, I had more than enough cleaning to do to keep me busy tonight. Now that it is nearly done, I feel relieved and accomplished. For some reason, when the house is neat and orderly I feel more relaxed. I love having everything put away, the bed made, and the dishes washed. Having a big mess just starts to eat away at me. Sometimes I see a mess and it launches me into a huge cleaning frenzy (usually at 10:30 at night when I should be laying in bed). When I get into those moods I just won’t stop until the cleaning is done, while Eric is usually sound asleep in bed, unaware of my compulsive urge to neaten up the house. Tonight, the need to clean started soon after I arrived home. It was perfect because Eric wouldn’t be home until later, so I had more time before needing to start dinner. I walked around the house cleaning up dishes, sorting laundry, and making the bed, without feeling the need to rush. When Eric finally called around 7:00 pm, I was half done cleaning and ready to start dinner. Quick and simple dinners are my specialty and this one was no exception. 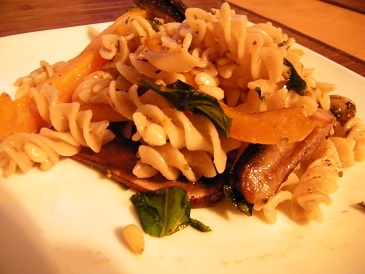 I made whole grain rice pasta topped with extra virgin olive oil, fresh basil, bright golden-hued bell pepper strips, and seasoned portabello mushroom slices. Despite that it only took 25 minutes of cook and prep time, it tasted amazing. The pasta dish also got Eric’s stamp of approval. 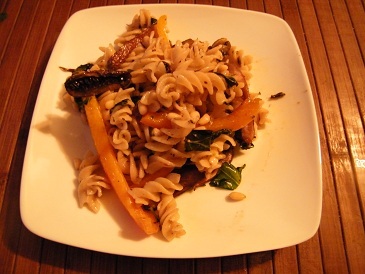 For a hearty tasting pasta recipe, read on. 1- Fill a medium-large pot with water and heat it on high. Then add the tablespoon of olive oil to a frying pan. 2- While you are waiting for the water to boil, slice the bell pepper and portabello mushroom. Once sliced, add them to the pan with the olive oil. Stir them in the oil so all of the veggies get coated. Add the sprinkle of salt, as well as the pepper and garlic powder. Let the mixture cook. Take it off the heat when the peppers are still crisp, but both vegetables are softened (and cooked through – just don’t over cook). 3- Add the pasta when the water is boiling. Add a dash of salt and stir it up. When the pasta is done drain it and put it back in the pot. Then add the extra virgin olive oil and spices, as well as the vegetable mixture. Stir and add the fresh basil and pine nuts. It is that simple! This basil portabello pasta dinner didn’t disappoint. Do you have any favorite quick, yet delicious go-to weeknight meals? This looks delicious! All of my favourites included plus quick, I’m excited to try this one out! Let me know how it comes out for you and if you add anything to it! I love entertaining and cooking for people also! It makes cooking that much more fun. This sounds like such a tasty pasta dish! Well I’m glad I’m not alone in my joy of feeding others 🙂 The dish was very tasty! It was one that I definitely had seconds of.